Samuel Curtis's diary and two letters from the War. 100-year-old diary from Jewish GI sheds light on what it was like to be at the front. I never cease to be amazed by the incredible stories I’m fortunate to learn about and share in the Jewish News. This is one right up there in the incredible column because it’s a story that is 100 years old — and I have a handwritten journal to back me up, courtesy of Allen Bennett of Detroit. The journal, measuring only 2.5 inches by 4 inches, is barely held together by its weathered leather cover. The author of the entries is Bennett’s great-uncle Samuel Curtis, who documents in detail his experiences serving on the front during the Great War — World War I.
Allen, 78, reached out to the Jewish News to share with the community this jewel of an artifact he had. “I realized 2018 was the 100th anniversary of the Armistice, the end of WWI,” Allen said, “and I thought it would be interesting to share my great-uncle’s experience as a Jew and lifelong citizen of Detroit.” The Curtis family’s history in the city dates back to 1840. That 100th anniversary will be marked on the exact day of the Armistice, this Nov. 11, formerly known as Armistice Day and renamed Veterans Day in 1954 to honor all our vets. The first startling fact I learned about Samuel Curtis’ journey was that he was one of five brothers who served simultaneously during WWI: Samuel, David, Albert, Alec and Charles, all from Detroit, five sons of Bennett’s great-grandmother Esther Curtis. Samuel preceded his wife, Anna, in death by six months at age 84, and Allen only happened upon his great-uncle’s journal after her passing in 1979 at age 83. 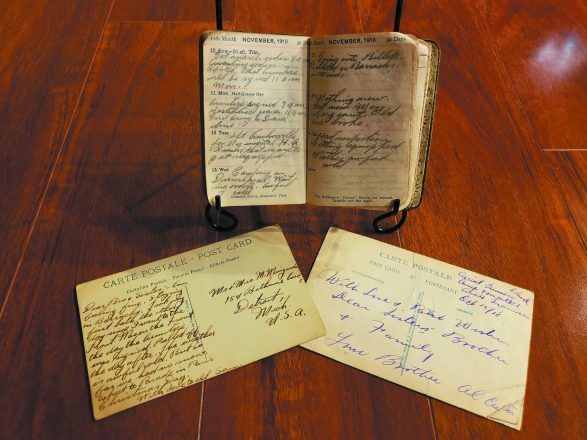 “I found his journal while cleaning out her apartment,” said Allen, who remained close with his great-aunt and cared for her in his great-uncle’s absence. “His journal was among his belongings in a desk drawer.” So much history hidden in clear sight. Samuel’s journal entries are the makings of a screenplay — moments of innocence mixed with terror and written with an almost eerie sense of calm from a 24-year-old whose very life was on the line. Samuel’s journey during WWI lasted approximately a year and half. There’s nearly a year’s worth of entries from 1918. It’s surreal really, to gaze upon Samuel’s journal, handwritten over a century ago during one of the most brutal periods in history. We do not often reflect on WWI although it was supposed to be the “war to end all wars.” Without apologies, we are used to focusing on our Greatest Generation and their contribution during WWII. I’ve had the privilege to write about many of our beloved WWII Jewish War Veterans (JWV). However, I know that all my dear, humble friends in the JWV would agree: Before the Greatest Generation there was another generation — one that saved the world in their own right 100 years ago. Aug. 18 Slept in first bed since coming to France. Aug. 29 Waiting for orders to proceed to front. Sept. 12 First shot 11:59. Continued all night. Drove the Germans back … no casualties. Sept. 30 Germans shelling roads ahead. Oct. 11 Saw German prisoners. Got ring from one. Oct. 19 Germans shelling all night. One killed. Oct. 20 Americans capture 1,250 prisoners. Oct. 22 Sky full of planes. Germans again come over in bombing machines. Nov. 3 Picked up message dropped by aeroplane stating Austria surrendered. Nov. 10 Reported that Armistice will be signed 11 am Monday. Nov. 11 Armistice signed. Hostilities cease. Nov. 19 Sent $50 money order home. Took bath. Had clothes sterilized. Nov. 21 Went downtown. Sergeant Jewell got lit up. Had to carry him up hill. Nov. 28 Thanksgiving Day. Roast ham, applesauce, celery, cocoa, dressing, mashed potatoes, donuts and pumpkin pie for dinner. Dec. 6 People do most anything for a loaf of bread and soap. Dec. 26 Rumors that we’re going home by January. See highlights of the American Jewish Experience in WWI exhibit in Kansas City. 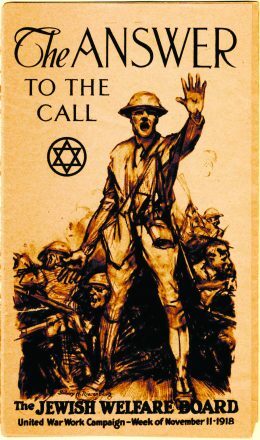 More than 250,000 Jews served in the American Expeditionary Forces in World War I. Yet, their stories — and the stories of those who remained in the U.S. during the war — often remain untold. Hailed by Time magazine as “a deep dive into a strange, history-shaking year” and by the New York Times as “remarkably prescient,” the exhibit titled “For Liberty: American Jewish Experience in WWI” at the National WWI Museum and Memorial in Kansas City, Mo., portrays what life was like as an American Jew on the home front and the battlefield through remarkable stories and unique artifacts. “Seeing these extraordinary objects in person and gaining a deeper understanding of American Jewish lives during WWI is a truly incredible experience,” says National WWI Museum and Memorial Senior Curator Doran Cart. Featured objects from the exhibition include a letter from American Jewish Joint Distribution Committee (JDC) leader Louis Marshall appealing to Jewish philanthropists like Julius Rosenwald to support the Ten Million Dollar Fund, American Jewish composer Irving Berlin’s draft registration card and two handwritten drafts of the Balfour Declaration by Leon Simon from July of 1917, the document that outlined British support for the establishment of the Jewish state of Israel. The trials and tribulations and the lasting effects of WWI on the American Jewish population are also shown through documents, such as a map that notes the amounts pledged to the JDC for Jewish war sufferers and a poster showing a shipment of kosher meat being loaded onto the SS Ashburn in New York City, bound for Danzig, Poland. The exhibit is open through Nov. 11. Learn more at theworldwar.org.